That much-cherished institution, MiHUB Cafe in Werribee, is ceasing to exist as we know it. The day after this story is published, the Synnot Street property that has housed this most admirable – and delicious! – community enterprise is to be auctioned, with the chances being it will become a medical centre of some sort. So MiHUB’s future is way up in the air, with no new venue being yet found. All is not lost, however, as the spirit is willing … besides, we’ve seen the MiHUB crew and their fare at the likes of the Indonesian Street Food Festival, and enjoyed that fare at a charity bash in Werribee. So there are other ways of being! 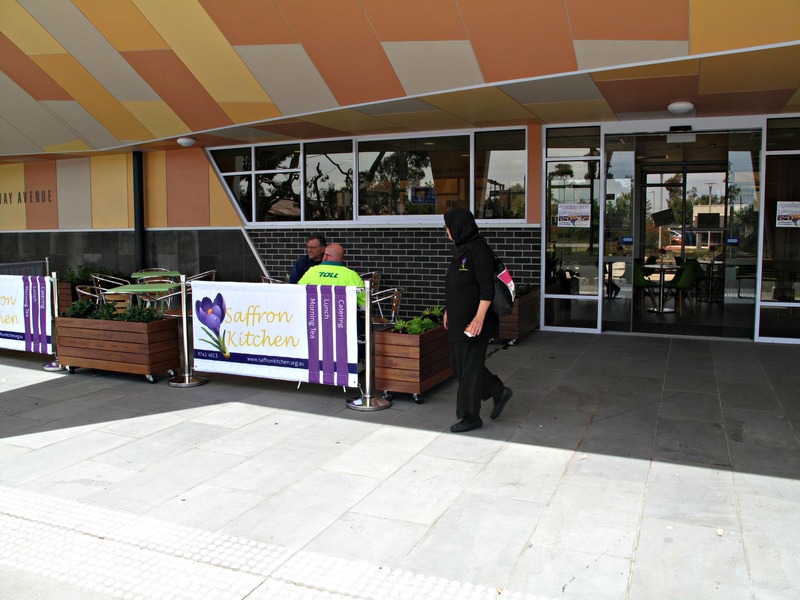 In the meantime, one MiHUB’s leading lights, Mother Nora, has taken up a role at the new branch of Saffron Kitche, operating out of the Laverton Community Hub. Where Nora goes, we follow … so it is that I rock up for a mid-week lunch. Under the auspices of the Wyndham Community & Education Centre, Saffron Kitchen “will target training and employment pathway opportunities for local people including the long-term unemployed, people with a disability and people from new and emerging communities”. It’s a simple place that offers simple, tasty and cheap vegetarian food. 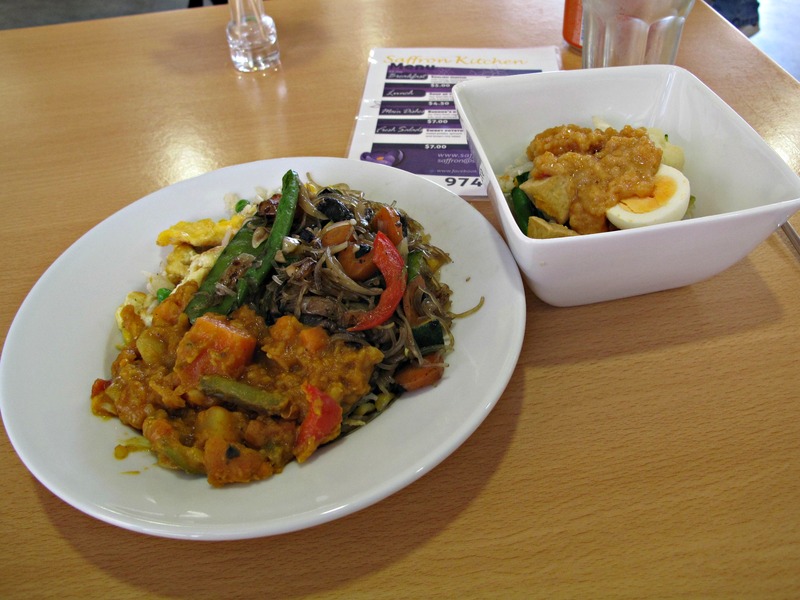 Each of my offerings – an eggy fried rice, a nice lentil-and-veg dish, glassy noodles with slithery mushrooms and gado gado with a beaut nutty sauce – are priced individually, but I snag a “combo” deal for $10. My $3.50 cafe latte is excellent! 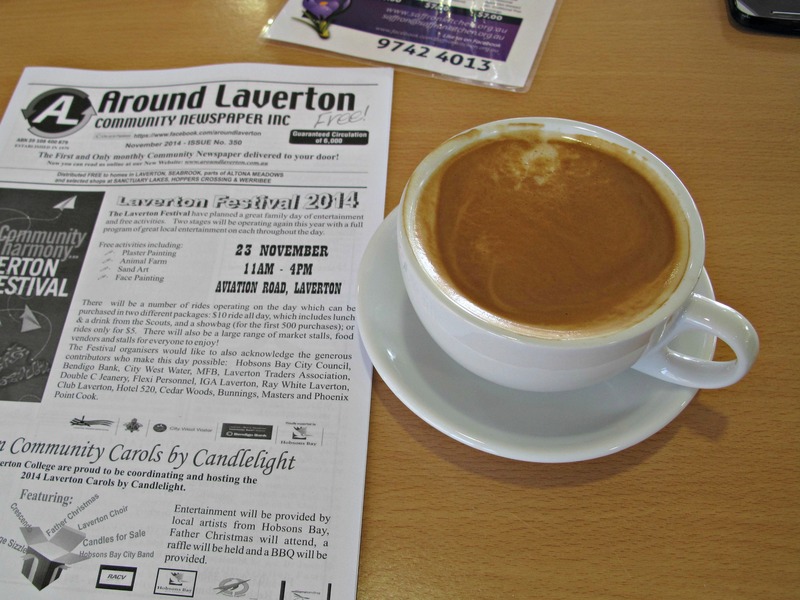 Laverton’s Saffron Kitchen is open 8am-4pm on week days. Missed out on trying it in Werribee but I will make sure I get to the Lavrton Hub. Sue Edwards MiHub still in operation up to 31/12/14 Come and visit before we close. I will! What are the opening hours?